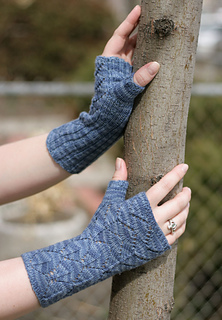 This fingerless mitt pattern follows the lace principles illustrated in the swatches from the lace structure tutorial presented at MimKnits.com. The pattern begins with pyramids of eyelets, then illustrates how moving the decreases changes the flow of the fabric. 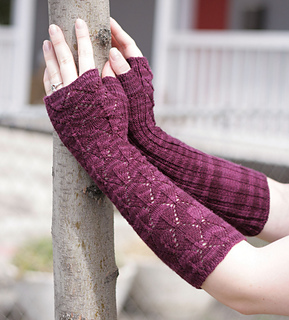 When you alternate the lace motifs, the pattern evolves into leaf lace. 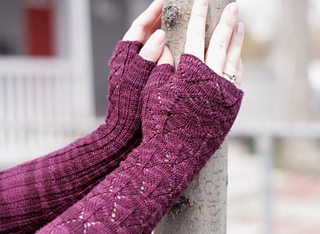 These mitts can be made either long or short to fit a multitude of uses. The short version would be great for spring, or a drafty office. 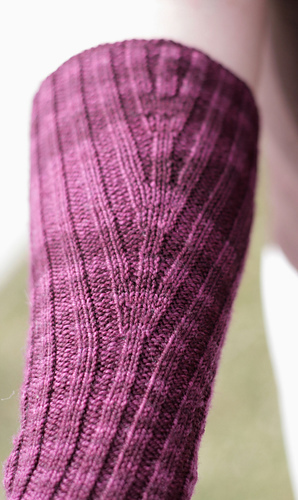 While the long version would be elegant and warm under a dress coat. These fingerless mitts are knit in the round from the hand to the arm, with thumb stitches knit onto waste yarn, then stitches are picked up above and below the waste yarn and the thumb is knit in the round. 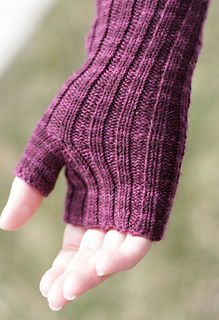 The Short version is knit using only Chart 1, while the Long version is knit by inserting Chart 2 at the indicated point. 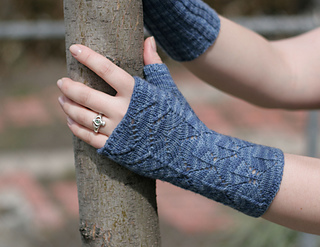 Chart 2 gradually increases in size on the under-side of the mitts, using repeats A & B as needed to get across the added stitches. To fit 7.5 (8.5) inch or 19 (21.5) cm hand circumference. Short version is 7.5 inches (19 cm) in length, Long version is 13 inches (33 cm) in length and 10.5 (11.5) inches or 27 (29) cm circumference at arm.